Are you all still buried under the white stuff? We managed to dig ourselves out and enjoy the sunshine and mounds of snow. I'm not sure who had more fun making snow angels - me or Chloe! As a renter, there are a lot of things in your home that can't be changed like the flooring, maybe the paint colours, and definitely the placement of walls. So how do you work within those constraints and create a space that reflects your taste and way of living? Where should you invest your money in what may be a temporary home? And how do you infuse style without breaking the landlord's rules (or your budget)? Come along and see how I help my siblings decorate their rental and maybe you'll get ideas for your own home. You can also follow me along on Instagram where I'll be tagging my decor finds for the rental with #rocktherental. 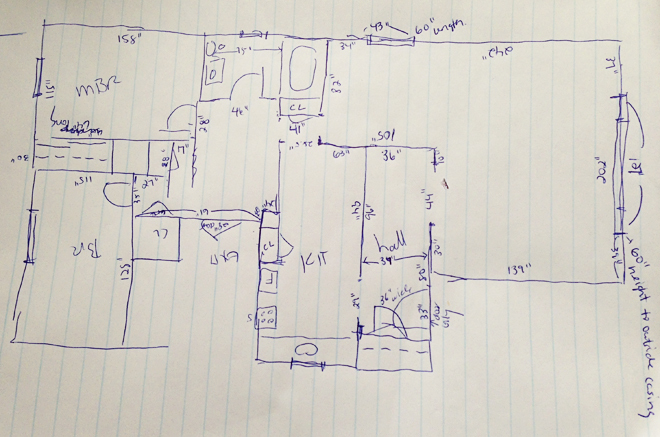 That's the floorplan for their 900 sq ft, 2 bedroom 1 bathroom apartment. Its got a great layout and I'll give you a tour soon!